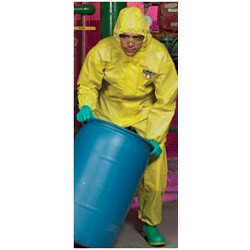 Mutex light is a type 5 & 6, antistatic, radioactive particles and biological agents certified coverall with elasticated hood, waist, wrists & ankles. Made of white laminated polypropylene - silicone & latex-free. Do not use the overalls when there is a defect. When the closing system is faulty, the seams open or any other defects which appear. The choice and use of personal protective equipment must comply with the European Directive No. 89/656/CEE of 30/11/1989. The employer must have previously analysed and assessed the risks linked to intervention and to those generated by the use of the personal protective equipment selected. Mao collar, Velcro® fastening. Collar is lined for greater comfort, 100% flame-retardant-treated inner lining. Press-stud wrist adjustment. Length: 90cm.Jacket in 100% aluminised para-aramid, 465 g/m2. Size: S to XXXL.EN ISO 11612:2008 (A1-B1-C3-D3-E3-F1): Heat and flame protection clothing. Centre press-stud and flap fastening. Adjustable straps for support. Straight leg. Pants in 100% aluminised para-aramid, 465 g/m2. Size: S to XXXL.EN ISO 11612:2008 (A1-B1-C3-D3-E3-F1): Heat and flame protection clothing. Mao collar, Velcro® fastening. Collar is lined for greater comfort, 100% flame-retardant- treated inner lining. Double safety fastening via inner flap with Velcro® and press-stud covered by a flap. Length: 115cm. Coat in 100% aluminised para-aramid, 465 g/m2. Size: S to XXXL.EN ISO 11612:2008 (A1-B1-C3-D3-E3-F1): Heat and flame protection clothing. Padded, built-in hood. Wide shoulder coverage. Large tempered glass, gold coated, curved visor. Hood in 100% aluminised para-aramid, 465 g/m2. Size: S to XXXL.EN ISO 11612:2008 (A1-B1-C3-D3-E3-F1): Heat and flame protection clothing. Apron with adjustable straps at the neck and waist. Comfortable and practical: straps designed in 100% flame retardant- treated cotton with adjustable plastic buckles. Length: 100cm. Apron in 100% aluminised para-aramid, 465 g/m2. 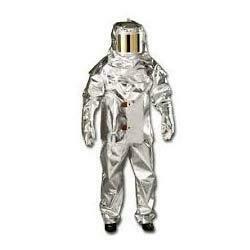 Size: S to XXXL.EN ISO 11612:2008 (A1-B1-C3-D3-E3-F1): Heat and flame protection clothing. 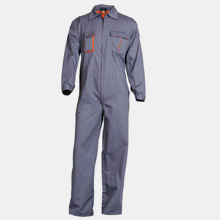 Coverall with concealed zipped on front pocket. Chest pockets fastened by zipper. metal zipper in front with 2 way puller. Chest pockets on both sides with metal zipper closure. Sleeve opening with snap button adjuster. Two side pockets and side slit opening. Action back pleats for ease of movements. Two back patch pockets and a tool pocket. Ideal for light weight industrial works. Available colors: Navy Blue, Royal Blue, Khaki, Bottle Green, Red, Grey, White, Orange. By keeping track of the latest market development, we are involved in offering an exclusive range of Protective Clothing to our clients. The offered product gives protection against acid. The entire range is fabricated using the superior quality basic material and latest techniques in accordance with international quality standards. In order ensure flawlessness in the offered product, our quality controllers test the entire range on various parameters. We offer this clothing to our clients at market leading price. Owing to the efforts of our skilled professionals, we have been constantly involved in distributing a qualitative assortment of Aluminized Clothing. We offer this product in various specifications in order to meet the various requirements of clients. In addition to this, this product is fabricated by our skilled team using the best quality raw material and latest technology in compliance with global industry norms. We are the leading manufacturer, wholesaler, trader & supplier of a superior quality range of Safety Rain Wear for Staff Full Size to our esteemed clients. The offered product is widely used for safety purpose. Our product is manufactured using superior quality raw and sound techniques in compliance with international quality standards by our talented professionals. In addition to this, we are offering this product in different sizes. 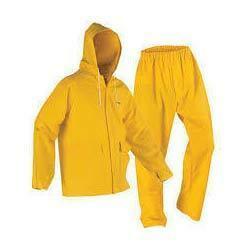 Our prestigious clients can avail this rain wear from us at market leading prices. 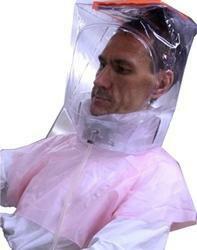 Protection of all body parts is a must while handling Fluids in any manufacturing facility. It is more so while handling Chemicals, Gas or Hot Crude & Oil as in refineries. 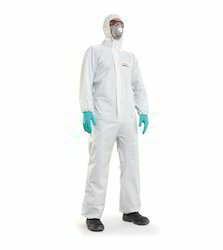 Body Protection Suits are just the right product for such applications as they are made up of tested Fabrics and SEAM-SEALED to provide safety form splashes, spillages, direct and indirect contacts as well. It is a Poly-Ethylene coated substrate quality fabric for ruggedness and durability. The fabric is tough, puncture resistant and retains its properties. TheFabric is tested as per EN-14325 for its properties and is impermeable to light chemicals and solvents. 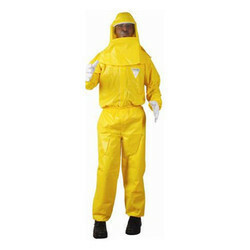 A three piece design suit consisting of a coat, pant (trouser) and hood with acetate visor for protection of face and eyes. The entire length of suit is Sealed at Seams to ensure non permeability of Fluids in any form. High density polyethylene film barrier laminated to spun bond polypropylene Substrate. Anti-Static: Meets the requirements of EN1149. Lakeland"Superb"degisn with comfort durability and protection. Looking for Body Protection ?